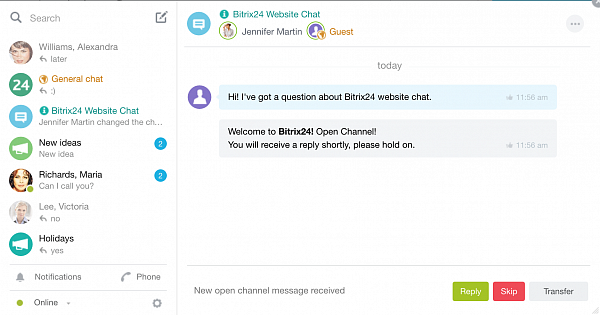 Website live chat has been added to Bitrix24 Open Channels. You can now install a widget (if you have a website) or use Bitrix24 hosted live chat web page to communicate with your clients in real time. And as most of 35+ Bitrix24 tools, it’s free. 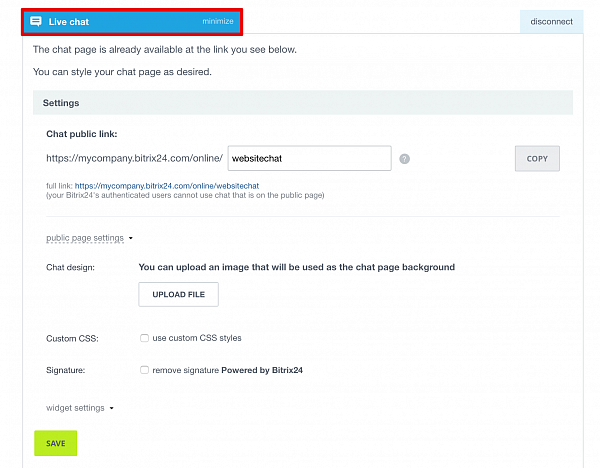 If you’ve worked with Bitrix24 Telephony or Open Channels before, you’ll find that website live chat works in a very similar manner. First, you need to set up an agent queue – a list of Bitrix24 users who’ll be answering online inquiries and the manner in which these enquiries will be distributed. 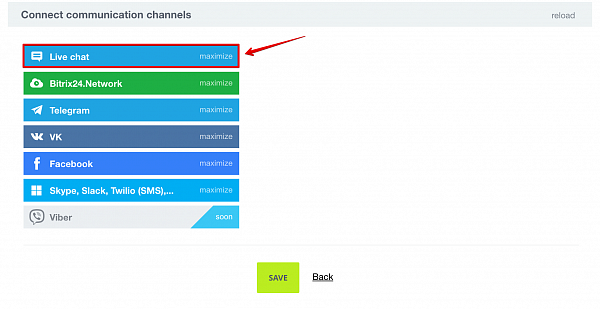 If you use bots or virtual assistants, these can be added to Bitrix24 live chat as well. You can create your own bot as well. Then you have to select response timeout – a period of time in which an incoming message should be answered by an agent or it will be reassigned to a new agent. Bitrix24 uses intelligent routing system. This means if any of your employees logged off or went on a break, they will be automatically excluded from the queue. All incoming messages are checked against your current CRM records and new conversation are added to history log. For example, if an existing client uses live chat, he or she will be automatically connected to an agent who talked to this person before or a dedicated account manager. But if a new user contacts you for the first time, Bitrix24 CRM will register this contact as a new lead. Manual chat routing (transferring conversation to another employee) is available as well. Importantly, you can enable ‘whisper mode’ in order to hide conversation from website visitor when discussing issues with fellow co-workers. You can set business hours in order to add after hours contact form to your live chat to capture leads when your agents aren’t available. And naturally, Bitrix24 live chat widget is easy to customize and you can remove ‘Powered by Bitrix24’ if you are a commercial user. As you try Bitrix24 live chat, keep the big picture in mind. And the big idea behind Bitrix24 CRM is this. No matter what communication channel your clients use – email, phone, messengers, social network, website forms, live chat – it all ends up in your CRM. Your employees no longer need to be logged into Skype, Telegram, Facebook, GroupMe, Kik, Slack or VK, because they can use a single Bitrix24 account to help your clients and sell more effectively from the office or on the go (yes, open channels are available inside Bitrix24 iOS and Android apps as well).